We are now days away from Christmas and I am as ready as I’ll ever be. Sure, I’ve got a menu of items to make for our big “Eve” party this weekend, but I’ve at least finalized what I’ll be serving and need to only make one more trip to the grocery store for our fresh ingredients. Anything else in my pantry, though, has dwindled down to next to nothing, including my compartment of baking ingredients. Only last week it was overflowing with chocolate morsels, flour, granulated and brown sugar and various other things needed to open my home bakery for the holidays. I was oh-so-proud of my baking cabinet and the sweets it helped me produce: the chocolate chips I had stocked up on to coat my Oreo truffles, the loads of granulated sugar it felt like I used with my candied orange peel, and the various other Christmas treats that remind me why I love to bake. My favorite holiday dessert, which has become a tradition since I first made it years ago, is considered my “pièce de résistance,” and I like to think my family is anticipating its big reveal this Saturday. The classic French Yule log is no joke – if, like me, you soak up every single complement thrown your way regarding any of your dishes, make a Bûche de Noël. You will be the talk of your family holiday party well into 2012. Preheat oven to 375 degrees, Fahrenheit. Grease bottom and sides of 15”x10” jellyroll pan; line with wax paper and grease and flour again. Beat egg yolks in large mixing bowl at high speed, about 5 minutes, until thick and pale. Gradually add 1/3 cup of sugar, beating well. Continue beating while adding water and vanilla. Gradually fold in cake flour and cocoa. In a separate bowl, beat egg whites at high speed until foamy. Add cream of tartar and salt and continue to beat until soft peaks form. Add remaining 1/3 cup of sugar, 1 tablespoon at a time, beating until stiff peaks form. Gently fold egg white mixture into egg yolk mixture. Spread batter evenly into prepared pan and bake for 10 minutes, until top springs back when touched. Sift powdered sugar on a rectangular, clean kitchen towel. Flip finished cake onto towel and peel off wax paper. Beginning on a short end, roll cake and towel up together and allow to cool on a wire rack with the seam side down. Melt chocolate in a double boiler until smooth. Beat butter at medium speed in a large bowl until creamy. Add melted chocolate and remaining ingredients, beating until spreading consistency. Once cake has cooled on wire rack, unroll and ice the top. Re-roll the cake and move to a serving tray. Cut a slice on a diagonal from one end and, using the icing as glue, position on the top or side of the roll. Ice the entire surface area of the cake, leaving the ends exposed, and gently score a fork over the surface to resemble wood grain. Garnish with fresh holiday greens, or rosemary and cranberries. 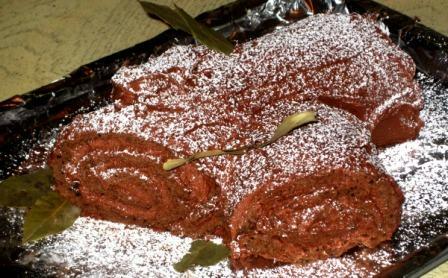 The creation of this classic French roulade is on the lengthy side, but I promise it is nothing you can’t handle armed with patience and some good Christmas music. Five minutes is a good measure of time for beating the egg yolks in the first step, but beating the whites requires a good eye and some knowledge of the different stages of stiffened whites – nothing Google images couldn’t help with. Another key technique is folding the stiffened egg white and sugar mixture into the yolk and cocoa mixture, ever so gently. Patience comes in handy here, as it does take some time for both to fully combine while working with a soft touch; I incorporate the egg whites in three steps to ease the two together. There no real need to continue with a gentle hand after the cake is finished baking, though. Its spongy texture (thanks to your know-how with egg whites and tender-touch) make it easy to roll without breaking. The chocolate buttercream is soft and spreadable, making for a stress-free creative process when adorning your Yule log with its final touches. For a more gentle wood grain, I like to use a steak knife; the serrated edges create a softer texture on the surface of the cake. A final sprinkling of powdered sugar gives the appearance of freshly flurried snow on tree bark. Though my Christmas cookies did go over well this year, and I have big plans for several delicious main and side courses this weekend, this recipe is what my loved ones anticipate every holiday season. True, this is the season of giving; I know my family members await the unveiling of the cake every year, so I love every single step in the process of making it. Still, “The Bûche,” as we have affectionately coined it, helps me get what I really want: lots of complements. Just like the Grinch’s tiny, little heart, when he hears the melodious residents of Who-ville on Christmas day, my ego will grow three sizes this Saturday.